Tiny Buddha began as a quote-a-day tweet by Lori Deschene and has grown into one of the most popular inspirational sites on the web. Because she believes we all have something to teach and something to learn, Lori runs Tiny Buddha as a community blog, featuring stories and insights from readers all over the globe. 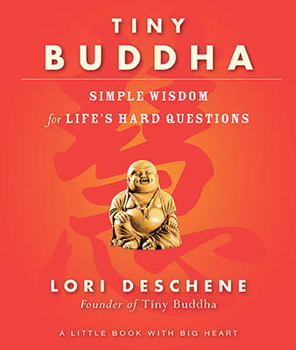 Tiny Buddha: Simple Wisdom for Life's Hard Questions is a book of crowdsourced wisdom on the topics that influence how we live our everyday lives: pain, change, fate, happiness, possibilities, and more. Deschene explores how these issues have played out in her own life and provides tips and exercises for reflection and taking action. The result is a guide that helps readers live mindfully, in the present and connected to others.